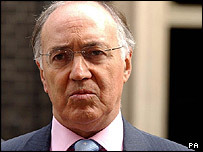 Judges could risk Britain's security by opposing new proposed anti-terror laws, Tory leader Michael Howard has said. Writing in the Daily Telegraph, Mr Howard warned judges not to thwart the wishes of Parliament. He argued it was the job of MPs to balance new counter-terrorism measures against the human rights of suspects. But the lord chancellor, Lord Falconer, said: "I don't think one should try to see it as a conflict between judges and the executive." Tony Blair recently said the laws passed by Parliament should be upheld. Mr Howard says he does not believe judges are being wilfully difficult. He blames the government for drawing the courts into the "political sphere" by passing the Human Rights Act, which means judges have to decide whether new laws are proportionate to their intended effect. The Conservative leader says the judiciary, together with the government and Opposition, have a duty to play its part in combating the terrorism threat. But he says he is worried that "judicial activism" has reached unprecedented level in obstructing MPs. Writing in The Daily Telegraph, he said: "Parliament must be supreme. Aggressive judicial activism will not only undermine the public's confidence in the impartiality of our judiciary. "It could also put our security at risk - and with it the freedoms the judges seek to defend. That would be a price we cannot be expected to pay." Mr Howard cites the House of Lords' ruling that it was illegal to detain foreign terror suspects in Belmarsh Prison as an example of judicial interference. He complains in particular about Lord Hoffman's comment in the Belmarsh judgement that "the real threat to the life of the nation... comes not from terrorism but from laws such as these." But Liberal Democrat peer Lord Lester QC said Mr Howard was being unfair to senior judges. The Human Rights Act gave judges the power to interpret and apply laws passed by Parliament, not thwart them, he argued. Lord Lester added: "It is completely astonishing that a modern day Conservative Party should wish to whittle away the safeguards for you and me by creating weaker, less effective judicial remedies than we have at present." And Lord Falconer said: "In a situation like the terrorist threats that we currently now have, the people rightly look to the politicians to come up with a response. "It is for the judges then to ensure that the response is given effect to, in accordance with the law. But the idea that there is a conflict is the wrong way to look at it." The row comes as Lord Falconer gave details of the government's plans for special pre-trial hearings to assess whether sensitive material, such as phone tap evidence, could be used in a conventional trial. This could help with using intelligence material without revealing informants' identities or how the information was obtained, Lord Falconer said. Civil rights group Liberty said the involvement of a judge in the special pre-trial courts could not "sanitise an unfair process". In a separate move, judges could decide whether a terror suspect should be held any longer than the current maximum of 14 days. Police chiefs want the detention limit extended to three months.